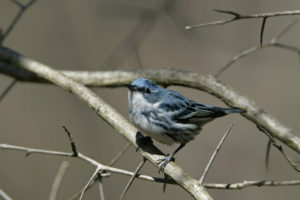 A small warbler, the males have a cerulean blue back and cheeks, white chest and belly with a dark ring across the chest. The streaks on the side are the same colour as back. Females are more blue-grey and the chest and belly are slightly yellowish. Both sexes have two broad white wing bars. Since they nest and feed high in the tree canopy it is easier to learn their distinctive call and identify this bird by ear rather than sight. Lay a clutch of 3-4 eggs in a nest made from bark fibres, grass and spider webs. Overwinters in central and northern South America. Prefer large areas of relatively undisturbed deciduous forests. Brown-headed Cowbirds lay their eggs in the warbler’s nest and the young cowbirds out compete the young warblers (brood parasitism).